We all like to reminisce about Telford, and all it takes is something in the back of a drawer or a loft clear out to get the memories flooding back. 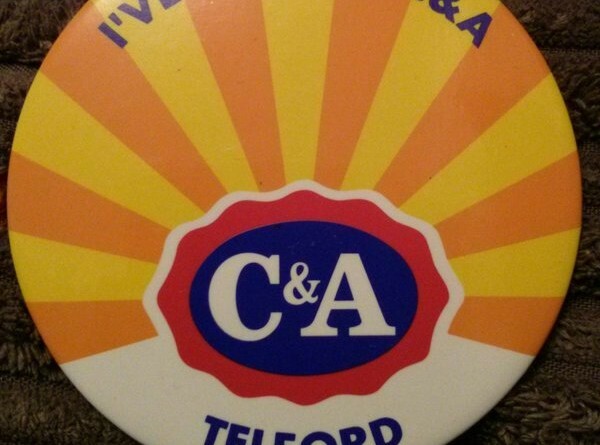 In this case, it was a C&A badge that came from the Telford store in the Shopping Centre, discovered by @JohnBow3n. C&A occupied a large store which is roughly where New Look is now on one side, and Galleries Alive and the 99p store is now. Footfall in this store was enhanced as it created a cut-through from one side of the centre to the other. C&A finished in the UK around 2000, although you can still find the brand on the continent. Using badges as little reminders of the past is not as unusual as you might think. Take a look at the other badges we have featured previously. ← Do you get Tax Credits?